Staying healthy on the trail is vital if you want to maintain maximum performance and avoid unnecessary ailments or set backs that come from poor nutrition and care. To enjoy your hikes to the fullest you should always pack your essentials first so you never have to stop and worry when you're out on the trail. Let's start by stating the obvious: Staying properly hydrated should be your No. 1 concern when out on the trail. If you are heading out for a short day hike that won't have you on the trail for more than a few hours, you should pack enough water to drink roughly 20-ounces per hour. For longer efforts on the trail you should make it a point to stop and intake 10 ounces every 15 minutes in order to stay fully hydrated and healthy. Simply put, water is the ideal liquid for most hikers. However, longer or more strenuous hikes often call for liquids with a little extra oomph, most notably sports drinks and mixes. These enhanced liquids contain electrolytes, meaning they not only keep you hydrated when you're exerting yourself in hot weather but they also protect you from a little thing called over-hydration. Over-hydration is what happens when the amount of salt and other electrolytes in your body become too diluted and your sodium levels become dangerously low. Short hikes don't call for as much meal planning as longer backpacking trips do but your nutritional needs remain the same regardless, which is why you should educate yourself on the types of food that will help repair and strengthen your body during more active periods. For high levels of physical activity you want foods that provide physical energy and mental fuel (carbohydrates), and promote a healthy nervous system (B-vitamins, iron) while building and repairing cells (vegetable proteins). Consider planning meals that contain whole grains and starchy vegetables, like rice, cornmeal, or potatoes. If you're looking for bars or other easy meals to eat on the go, first make sure they are actually providing you with the nutritional value you require. Another food group that is important for longer backpacking trips are your meats, poultries, eggs, and dairy items. On the trail you really don't require much of these foods, however once every day or two in small portions will make a huge difference to your performance and health on the trail. The calcium and protein intake will help improve bone strength and muscle contraction so in order to keep your nutritional needs in balance consider packing items that contain ingredients like powered milk, peanut butter, or nuts and seeds for the proteins and healthy fats. LARABARs, made from minimal, pure ingredients, are a great place to start. The longer the trip, the harder it gets to pack food that will provide enough nutritional value for the length of time you're on the trail. But don't worry, there is an easy solution. Most experienced hikers and backcountry explorers use vitamins and supplements to meet their personal health needs instead of relying 100 percent on food. Not only will meal planning seem much easier but you'll have more room in your pack since vitamins and supplements don't take up very much room. To avoid dangerous nutrient gaps in your diet while on the trail you should take advantage of supplements that not only bridge the gap but help you recover quicker, boost your energy, and increase your overall health and stamina. 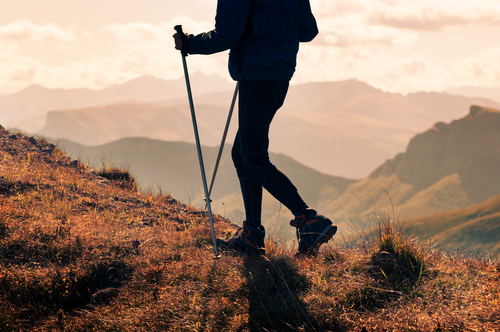 For hikers putting in long days of high energy, consider adding supplements like calcium, probiotics, fish oil, and a multi vitamin to your hiking pack. Amway, a global leader in health products, sells a variety of natural and plant-based supplements. They will help protect and nourish your body out on the trail so you don't have to worry about starving your body of the nutrition it requires. It might seem obvious to you, but many hikers don't realize the significance of safety and survival gear on the trail and the role it plays toward overall health. Accidents, mistakes, slip-ups—they all happen on a daily basis, even when you're on the trail. So being prepared with a few key items for safety and survival will give you wonderful peace of mind in case the unexpected occurs. An item you should never hit the trail without is a basic first aid kit. You can find a wide range of first aid kits at almost any grocery store or gas station but these can also be personalized and purchased online, of course. The Red Cross sells a variety of first aid kids and supplies, including a CPR keychain. For added peace of mind throw in a pocket knife, a small coil of paracord, and a fire starter so it's all in one place. Don't forget other health-conscious items like sunscreen and sunglasses too. If you fear the trail might be too difficult for you or perhaps the weather doesn't look very promising, prepare yourself and pack anything you think you might need so you won't be without it on the trail. Keep your hydration and nutrition in the forefront of your mind when packing for your next hiking trip. Don't pack food items that give you little to no nutritional value and be prepared with extra supplements and liquids so you can be confident and ready on the trail.